Thanks to the crinoline I put under today’s skirt combined with the wide belt, I felt like I popped out of the set of Happy Days. Obviously shoes and earrings land me firmly in 2010. There’s not really that much more to say about today’s outfit. Nothing spectacular, nothing horrific. Although, I will let you in on a little secret, wearing a crinoline on your bike without tights is a bit scratchy on the bum. What we do for fashion eh? Are you familiar with Groupon? If not, it’s simple. Every day a different product or service is offered at an extreme discount. Now Groupon is big in the US and there are a number of copy-cats here in the UK. Usually, the offer is on a service such as a massage or a restaurant. Yes, I’ve purchased from this service (more than a few times) in the past. Deals all around. Yesterday, I was wowed and won over by the offer from Key Noir (that’s one of the UK groupon sites). I’m sure you are not surprised to hear that yesterday’s mob-deal was actually for SHOES. 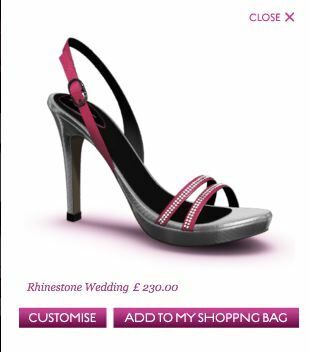 The best bit is that it was not just for any shoes; the voucher was for a pair of bespoke shoes. Enter UPPERSTREET.COM. 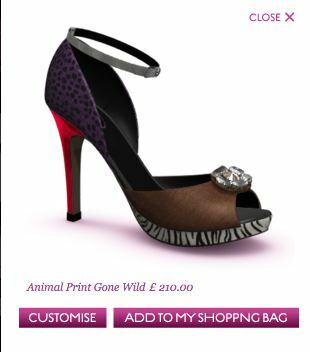 This is a super cool site which allows you to create your own shoes. 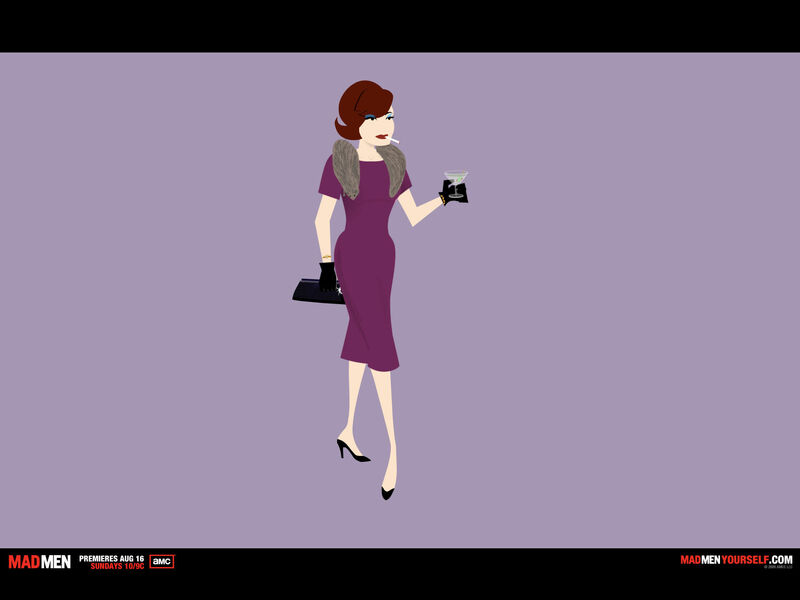 It’s kind of like StyleShake (which helped me design this dress). Upperstreet allows you to choose the heel, toe, straps, embellishments, material (leather, patent, satin etc) and mix them in all different combinations. As you can see, you can create some real monstrosities. Here’s a few I made. So, yesterday when Key Noir offered a massive discount on a voucher to create a pair of bespoke shoes, I jumped in on it and bought the voucher. I have no reason for another pair of shoes and frankly have no idea what I’ll ultimately design. However, I’m very excited about the opportunity. In the meantime, go on and have a go. Season Four of Mad Men hits the airwaves on Sunday night and, while I won’t be able to watch it as it airs (I’ll be chez maman and she does not get AMC), you KNOW I will be watching online the SECOND it shows up there! 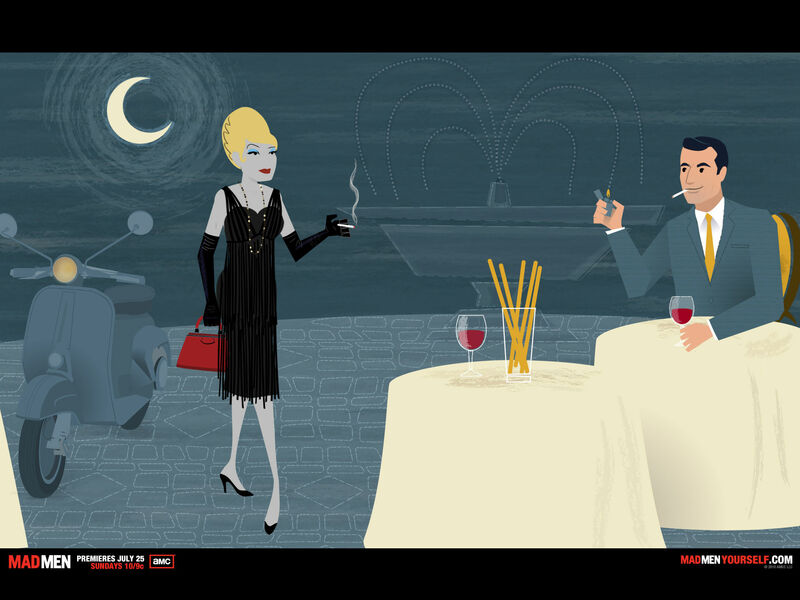 For more Mad Men hype (except, in this case, it’s not hype!) and info, head over here. Heck, why not pour yourself a martini and really get into the spirit of things while you surf? 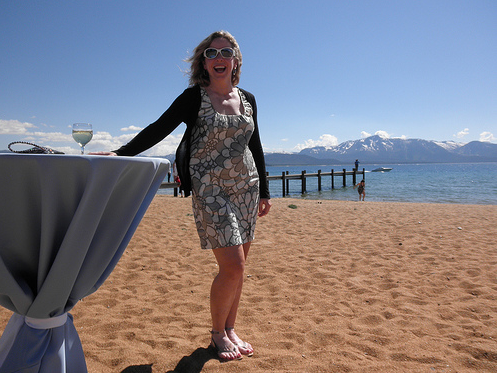 She says the cardi was perfect for the temp (well, not on the beach, but for the rest of the day). I haven’t had a lot of blog fodder lately. However, with YYZ away, I have to do my part to keep this little space of the interweb active. Here’s a few pics from our summer weekends – mostly outdoorsy-fashion. 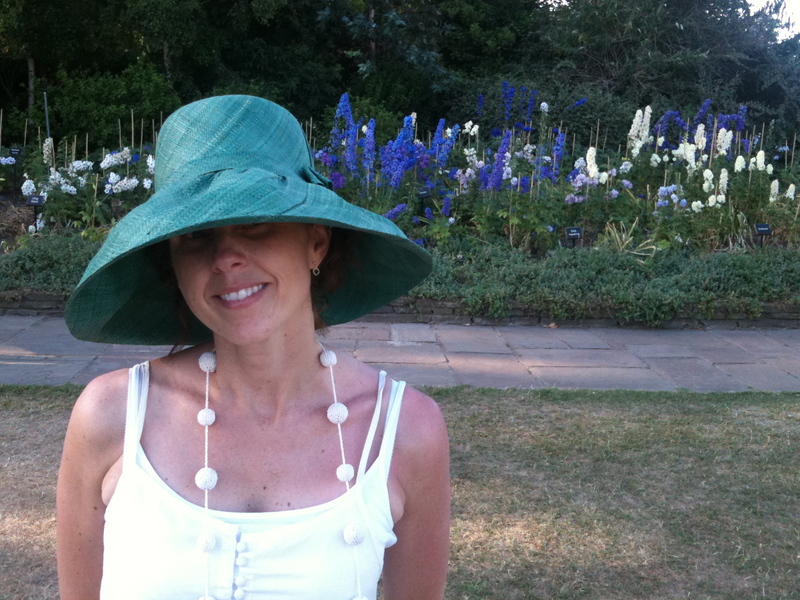 Here’s one as we walk along the canals and hang out in London parks. 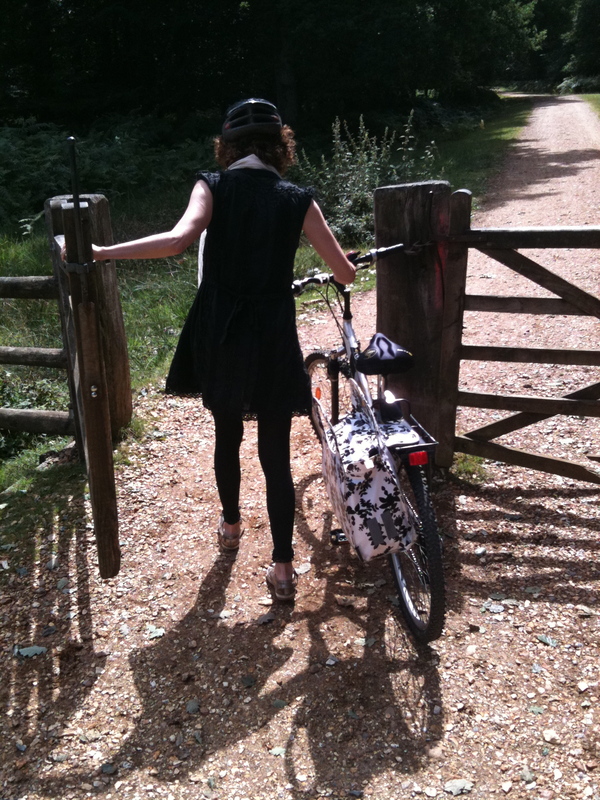 This past weekend we went biking through the New Forest. As you can see, it was really about the fashion this weekend. Arriving in Style at Brockenhurst Station! We had biked from Brockenhurst to Beaulieu (believe it or not they pronounce it Bewley here) and stumbled on a summer fete. You know what that meant! Yes, a bit of rummaging! 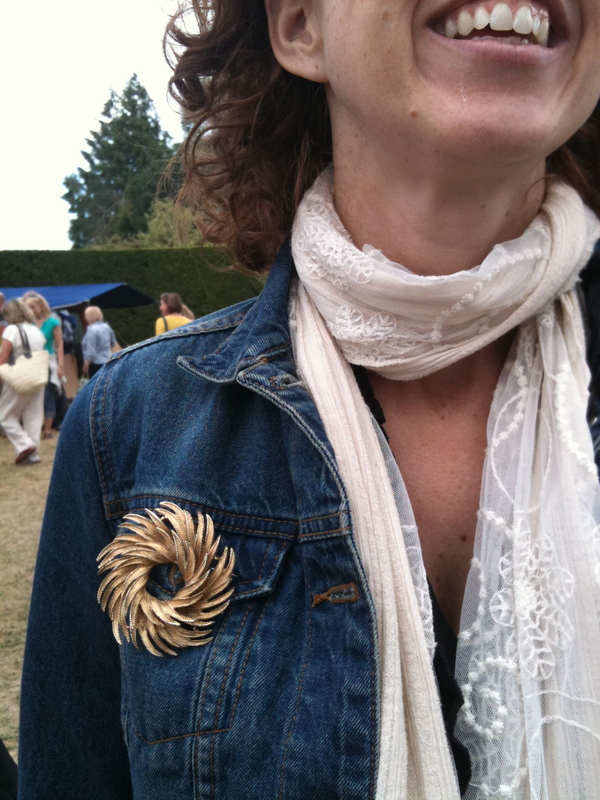 Look what I found for £1.50 – a funky vintage brooch for my jean jacket. It looked fab with my little golden sneakers. So that’s it from my side. YYZ will soon be back to add some glamour back to these pages. In the meantime, if you ever find yourself looking for a Bed & Breakfast in the New Forest, visit the Daisybank Cottage Boutique B&B. It was super! Look at this outfit. Jeans (skirt) and a Tee. Look at the titles of posts by YYZ. All nicely chosen to match songs she knows. Look at this title – Skeleton Boy. Have you ever heard of this song or group? Yeah, me neither. All I do is throw a keyword in to Spotify or Last.fm and see what they suggest. 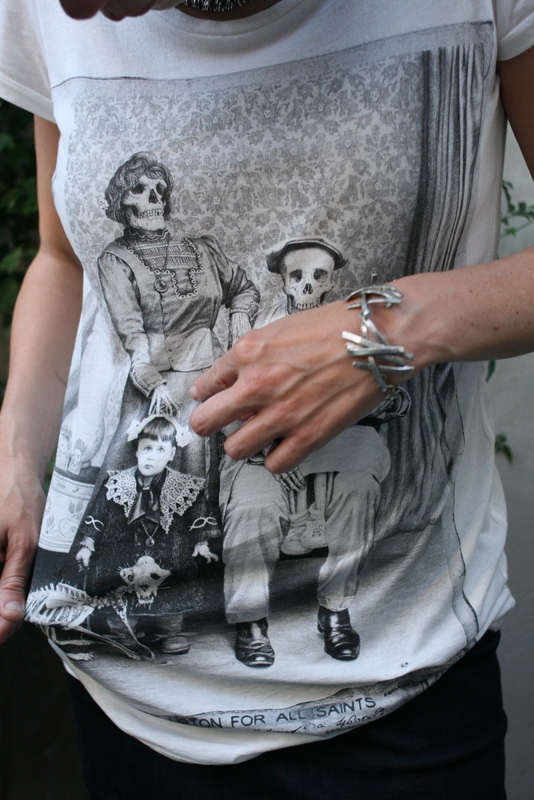 As mentioned earlier in the year, skulls were EVERYWHERE last year. I didn’t purchase any skulls last year, but I finally caught up with the waning trend two weeks ago on my trip to Brighton. Bracelet bought in Quebec City (years ago). * you’ve seen these babies on both YYZ and me. We both bought a pair on our 40th birthday trip in NYC. After I showed J this post, he reminded me that while I’m behind the trend, he was ahead of it. 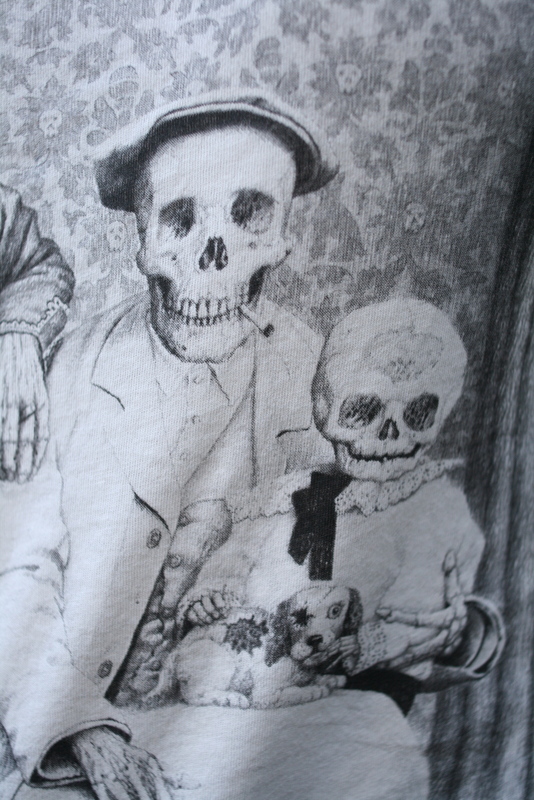 He created this video for a friend of ours – Sans Soleil – and it proudly features skeletons. Sans Soleil, Asprovalta, music video on Vimeo. I am off on holiday for a week; we will be staying at a cottage, on a lake, about 2 1/2 hours north of the city. There is no internet access, so I will not be able to post. In the interim, I leave you with my latest obsession: the Eiffel Tower fishnets from the Jean-Paul Gaulthier Fall 2010 haute couture show last week in Paris. Seriously– I NEED these stockings! Sorry– for some reason, this is the best/only photo I can find of the stockings, even though the interweb is a-buzz with references to them.